It's Fashion Friday, time to see the fancy and fanciful outfits that the kiddos put together this week. For the first outfit, Miss Ree was somewhat obsessed with multiple colors (as you'll hear several times on this video), and Miss Ro once again grabbed her favorite pink ruffly polka dot skirt (and then tried to claim that her head-to-toe-pink ensemble was also multicolored. Ahem.). Doesn't Ro's cool nonchalance—the little shrug with "Dass just a neckliss"—kill you?! Heh! Oh, Das just a necklace! Your girlies are so very, very cute!! This is still such fun for us to watch but not for mamma and wela when it comes to laundry! Ugh!! Hi! I just started reading your blog and I love it. Your girls are beautiful! 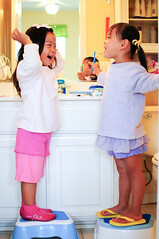 And I love the idea of "Fashion Friday" - I can't wait until my little one is old enough to join in! I say hang it up and wear it again. To heck with laundering things that have been worn for just a few hours (unless of course they are stained, sticky, or stinky). Better and better every week! Good grief, they are cuties alright! Laundry...oh yes, it is my nemesis as well. The laundry in my daughter's room always drives me crazy. I never know what's dirty and what's clean. They look adorable, as usual. Love the outfits! 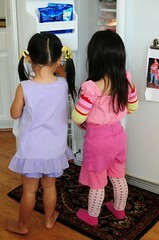 I ran across some photos of my twins when they were little in some "choice" outfits. I'll have to put them into one of my Flashback Friday posts one of these days and then I'll have you check it out. My favorite is how my one daughter always loved wearing fun hats. But it's their adorable way of showing what they're wearing that gives me a big grin all day! And about that laundry. It's the folding I can't stand. I'd rather scrub toilets.......almost! ONce again, my favorite day of the week! dat just a necklace. BwwwaaaHaHaHaHa! Love it. If I say it once, I say it 100x times per week, "No more laundry! You are not changing clothes one more time today!" I look down and my filthy clothes after finishing dinner dishes and wonder if maybe I could have used a few fashion changes myself! Longtime lurker, since before referral day, but first-time commenter...Might a new rule be something like this? They can only choose new outfit pieces until the closet doors close. Once the doors are closed (by the laundry police), they are done adding flair, maybe an hour or two after dressing the first time? Posted my link too. My sister always looks forward to FCF! I feel your pain on the laundry! I had to limit Maddy to two wardrobe changes (not counting PJ's) per day. But what do you do if only one of your Princesses wants to make a fashion statement while her sister just wants to layer on the accessories and role-play? Does that count as "fashion" too? I hope so because that's what I'm sharing this week on my blog! Multi-colored. What a vocabulary! You are such an incredible mom giving them so much rich descriptive language to use. As cute as always!!! The video totally made me smile. When I check your posts my husband always says "What are you smiling about?" My standard answer - Salsa Girls!!!! Always love the girls' fashion choices. Know what you mean about the laundry. It's hard to keep up with the 6 of us. When my older daughter started the layering thing I about came unglued and threatened to make her do all her own laundry. Glad Maimie doesn't do too much layering yet. PS Everytime I grab the laptop Maimie wants to "watch movies of Ro and Ree with mommy". So cute!